How to get there You can start to the north in either Châteux-d’Oex (902m) or Les Moulins (890m) and after a moderate climb to just after Col de la Lécherette (1389m), you take off on a narrow road that is sometimes rather steep and goes up and down before reaching the highest point (1581m) where there is a steep descent to the pass and a few metres up again. The road will eventually end in every direction from here. 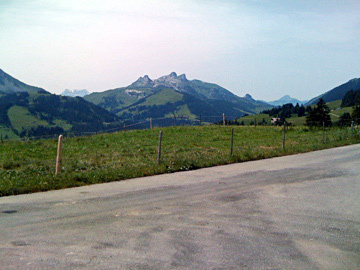 You can also take a small road from Montbovon (798m) via Allières to Col de la Lécherette. Other comments I was curious about the road going down toward Châteux-d’Oex at the pass as it started out nicely asphalted, so I went down a bit on this steep road only to find out it was a dead end and a hard climb back! You could continue on the road ahead as it will offer more lovely views of the area, but it is already lovely enough at the pass itself. Well worth a visit!